I do put some of my experiences in my books — i.e. I incorporate way more Chinese culture than is healthy — but since my books normally concern MAGIC and THRONES and DRAGONS (okay, not really) it’s sort of hard for me to base a whole book around my personal experiences. It would be terrifying, though. I never finished the Unwind series, but I’m going to! It’s on my (infinitely long) to-do list. I need to reread the first one though, because I read it like 3 years ago and details are too hazy. Darn. I was getting excited because you said “personal experience” and then “dragons”. DON’T TELL ME YOU DON’T HAVE ANY EXPERIENCE WTIH DRAGONS. I’LL CRY. DON’T FAIL ME LIKE THIS, ALYSSA. Enjoy your emotion Cait… I know that it’s a rare occurrence! Being serious though, I think it’s beautiful when authors put themselves and their families into a story, BUT… isn’t that what all authors do anyway? I mean, aren’t books based on the author’s experience usually? I’m not a writer, so I don’t really know! I KNOW RIGHT?! MY COLD HEART IS BEATING LIVELY. :’) I’m so proud of me. The quotes really sold this one 🙂 Seriously, I think I already love the writing style and I’ve read less than 100 words. *hide so your TBR doesn’t glower at me* I’M SORRY BUT I’M NOT ACTUALLY SORRY. I know, right, though?! Those quotes. I die of happiness with this kind of extraordinary writing. iT DESERVES A SHINY STICKER. Or something. DUDE THIS SOUNDS AWESOME. And anything with a five-star rating from you earns my immediate intrigue. How have I not even heard of this book?? As for personal experiences in books…I did that pretty heavily with my NaNo novel last year. I’m reading it back now (since I’ve finished this draft of Daisy) and…it’s pretty confronting. But those stories always seem more real to me. Like It’s Kind of a Funny Story – that books hit me so hard. So I think it’s risky for the individual, but maybe good for readers? I think personal experience is okay, as long as it’s fiction. This book really affected me, because I have had family members with mental illness, and it was so honest. Life goes on, after all. I have read one book (good enough by Paula Yoo) that was very much her about her personal experience(told through fiction) and then she didn’t write anymore novels. So I think it’s dangerous to put so much of yourself out there without creativity or something (like the ship) to counter it. I think personal experience-like diversity or bullying is okay in a book as long as it’s oblique and it doesn’t become about you. Challenger Deep is really awesome, thanks for the review! Shusterman is one of my favourite authors. I’ll check this one out, even if it seems different to Unwind. Great review. YES I AM 100% TRUSTWORTHY. *nods* It’s so different to Alice, but they’re both just incredible in different ways. I actually like comparing the different perspectives. This book sounds terrific. I didn’t know Neal Shusterman used a lot of personal experiences in it. That’s also amazing that his son did the illustrations. I haven’t read any of Neal’s books before, but I’m seriously interested in this one. His books are sooooo good. Well. I’ve only read 3 altogether now, but they’ve all been 4.5 and 5-star reads. SO YEAH. I’m just a microscopically bit addicted. YOU NEED IT BASICALLY. YES. I HAD TROUBLE WITH THE BEGINNING TOO, and I didn’t understand some parts, but I guess that’s okay because this was such an eye opener to schizophrenia and it made me aware of what the mental illness ACTUALLY IS. And I love how this is based on his son. ME TOO. I was really freaking out that I wouldn’t be able to get onboard (har har) with it because of the wildness and weirdness and I was like “What the heeeck is going on”. But it turns out that was PERFECT. I couldn’t love it more, tbh. 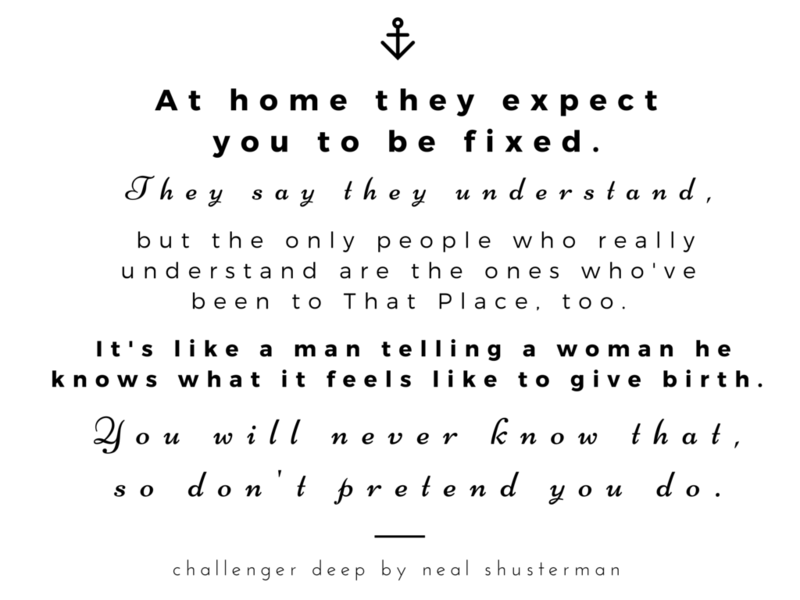 I have not read Challenger Deep yet but I so need to!!!!!! I’ve been hearing so many good things about it, and I love the write-up. Gah, how could make me want it more, Cait! It’s very cruel of you. *pouts* I loved the quotes you included–and also, I am in awe of your photography skills. 🙂 Also, five stars–I have seen one of the mythical five star reviews. I have to go read this book now!!!!!!!!!!!!!!!!!! YES SEE? I AM CAPABLE OF 5-STAR REVIEWS!!! *flails* I actually have a few 4-star reviews coming up too. 😉 And then I’ll hit you guys with the mini-reviews-of-horror again. Gah. I’m awful. I actually haven’t read anything by this author, but this book sounds like the kind of books that will make me cry, which I like. Gonna add this to my tbr now! Books that make one cry are THE BEST. Although I didn’t actually tear up in this one I just felt…woah. Emotional roller coaster. This sounds brilliant, I’m adding it to my TBR right now. I agree that it’s very brave to put your own experiences into a novel, but I think that’s what makes them more realistic. As we said on your blog post about diverse characters, unless you experience it yourself, it’s hard to make it 100% authentic feeling, so I applaud authors including their own experiences. EXACTLY. And it makes me trust the book so much because I know the author’s been there! I read this book a couple of months ago for review and ABSOLUTELY LOVED IT! I don’t very often connect with books with a male protagonist, for some reason, but this one really worked for me. I loved how the story was structured and how the illustrations actually contributed something to the story. FJADKLF I JUST HAVE SO MANY EMOTIONS ABOUT THIS BOOK RIGHT NOW. *hyperventilates quietly* I really connected to Caden too. I think it’s great when authors are brave enough to put real experiences into their books (and then actually admit it). I’m too much of a chicken to ever want to do that, but I’m always impressed with people who are completely unashamed of who they are. NO I HAVEN’T READ THIS YET, THANKS FOR RUBBING IT IN. 😀 Still waiting for the obnoxiously slow readers at my library to finish up. Soooooon. I AM A CHICKEN TOO. I would just freak. heeh. The criticism would be so muh more personal, right? GAWSH. THOSE OBNOXIOUSLY SLOW READERS NEED TO BE SUBTLY GLARED AT. I think that you always put something of yourself in anything you write. To me writing is about how you view the world and the way people interact with each other and themselves so in a way it’s inevitable. To put that much of yourself in a book however is just brave and I admire that. I think that of course some of the criticism might hurt more but you have to weigh that against what I think would be a rather liberating feeling. Like talking to your best friend about something difficult. That is so true! I think it’s unavoidable to put us into our writing…although I think this takes it to a BIG level. I would be so nervous of how people received it. *gulps* But I haven’t heard anything negative about Challenger Deep so far. Yeah. I’ve been toying with a couple of play ideas inspired by my own life but I don’t think I’m quite ready yet for that. One thing to see it written, another to see it out on stage. They’re still there though. one day. I MUST READ THIS! It sounds so good!!!!! I’m putting it on my TBR list right now! Anywhoo I WANT TO READ THIS BOOK NOW. YOU MUST GO READ IT, HONESTLY IT IS THAT GOOD. And I totally agree…it makes things sooo believable. It’s nice to shut up my over-analysing brain for once and just say “ACCEPT THIS. THE AUTHOR LIVED IT.” HEHE. Oooh, this sounds amazing! I wish I knew about it sooner. I have been holding Mental Illness May on my blog, and this sounds like a really intriguing and interesting, yet poignant read. I must get hold of a copy! Thank you for the brilliant review, Cait! So yes! More books with authors being brave, please! If they feel they can, no pressure. Really want to read It’s Kind of a Funny Story too, thought I’d not heard of Alice and the Fly before, so I’ll look that up. I MUST read this! My sister has been struggling with mental illness for a very long time, and my mother has been ill all of my life. Mostly there are just questions and questions and false diagnostics and everyone trying to tell everyone that everyone’s FINE, but it doesn’t always work out that way. Thanks for the review- I’ll be sure to pick this up! DUUUUDE I THINK YOU WILL LIKE THIS ONE, THEN. I have experience with MI (although not schizophrenia) in my family too so these kind of books are all very personal and…yeah. I adore it when they’re done right. MY PINEAPPLE HEART IS GLAD. This book looks SO good, and I can’t wait to read it! I don’t think I’d be too afraid to include real experiences in my writing, since we all unconsciously do that one way or another. I might be too afraid to admit that I’ve experienced that, though. And writing is already a personal endeavour, so why not go all the way? YES! EXACTLY! I feel like it’s making yourself very vulnerable, right? But still, I absolutely admire Neal Shusterman for saying how personal this is. I just got this from the library and am so excited to start it Cait! I feel like so many books about mental illness being published aren’t really representations of mental illness – they’re more romanticized than anything else, you know? But I’m so glad this wasn’t like that. Not everyone who has mental illness finds the perfect guy and is rescued from their illness, you know? And wow…those quotes are stunning and I love the sound of the parallels. Oh I agree. Or sometimes they’re just portrayed really…oddly. AND IT’S JUST NOT LIKE THAT. SO HUZZAH FOR BOOKS THAT ARE REALISTIC. I reeeally hope you like this one!! On the one hand, putting real-life experiences into a book can be risky… especially if it paints some people in a less-than-positive light. On the other hand, there’s the whole “write what you know” thing, and who better to write about something than someone who’s actually lived it? I don’t believe in perfection but this was a perfectly gorgeous expressive review, Cait. I loved it, like a lot. It’s so fantastic that books about mental illness are being more fairly and accurately represented now- I think the world and the people who are lucky enough to have access to these books need it so badly and I’m just thrilled that it’s happening. N’awww. YA MAKE ME BLUSH, ROMI. *flails* Definitely powerful and painful and….yup. I need chocolate to recover. And basically more Shusterman books asap. You used the quote! THAT QUOTE!! In- in the title! This sounds like an amazing book! When I find this book (okay, I’ve been watching Once Upon a Time. . .), I will read it! This sounds realistic. Because “the love interest ships out for the ocean and lives happily ever after,” yeah, that doesn’t happen. I mean, just look at Once Upon a Time- okay, maybe that had nothing to do with mental illnesses (come on, I’m sure some of those fairytale people have some, and if they don’t, surely they’ve developed some now). Wow, the fact that the author was so personally invested in the book- Wow! I can see that being a good thing for the book. I think it helps the readers a lot. Because the author knows. It’s one thing to hear if from someone who’s researched it; it’s another thing to hear it from someone who goes through this stuff/personally knows people who go through this stuff. They know the reality of it. It’s also incredibly brave. I don’t know if I could do something like that. I wouldn’t so much be afraid of the criticism from other people. I would fear my family and their criticism. I would fear the people who know me, the people who think they know, the people who recognize themselves in the book (to whose faces I would probably lie blankly to, “You are so paranoid! That’s not you. Don’t be ridiculous.” Not that they would believe me. . .). I would fear the people who feel as if I did them some injustice or who don’t like how I perceive them. I would fear the angry mob with torches banging on my door while I sleep, crying out for my blood!! Okay, that got a little crazy. But, yeah, I don’t know if I could do that. All the respect goes out to Shusterman! I need to read his books now. I haven’t watched OUAT but if it’s like most tv series…PSTD is probably there?! heheh. TV SHOWS ARE CRUEL TO THEIR CHARACTERS. (I kind of want to watch it for Peter Pan. xD He sounds evil and epic.) But yesss! It does make me really trust the content of the book when the author has such first-hand experience. But exactly, that’s my worries: The criticism becomes so much more personal, right? That would definitely worry me. HIDE US FROM THE ANGRY MOB AND PITCHFORKS. YES!! For the first half of the book, the parts where you’re in Caden’s fantasy world are just completely perplexing, but then it all comes together and you realize that it’s amazing!! I started this week ago but had to put it aside after 12%. Writing style – wise, it reminded me too much of some novels by Don DeLillo. And while I love such novels from time to time, I need to be in the right mood to enjoy them. So I am saving Challenger Dep for some other time. The fact that you had rocky start as well gives me hope that I may get pass 12% in the future and enjoy this book myself. Great review, Cait! Fair enough!! I was basically sweating at the beginning because I was SO THROWN. I didn’t expect it to be like that and I really struggle with that kind of writing usually…but, gah. I did fall in love. I hope you do manage to get back to it sometime! *cries in your arms* I BASICALLY NEED CHOCOLATE AND COMFORT, TBH. And yes, you need to read Neal Shusterman. Unwind is terrifying (first book that I ever lost sleep over) and Bruiser is adorable and sad. Okay, so I didn’t really read the review because I want to dig into this novel without preconceived expectations but THAT first quotation. Gaaah. I. Want. This. Book. And I think it’s risky, but drawing from personal experience also gives the author edge, in that they know first-hand. They understand. Speaking of which, Jen’s author’s note in All the Bright Places. Paint me shuttered hearts. I TOTALLY UNDERSTAND. If I’m uber excited about a book I skip all reviews. x) Ohmigosh, yes, All the Bright Places did it too. And I don’t know if you’ve read The Last Time We Say Goodbye by Cynthia Hand? But her book is a response of her brother committing suicide. I don’t understand how they’d be strong enough to write about it. AMAZING HUMANS, THEY ARE. I haven’t! But it’s in my TBR. I don’t think I’ll be able to write something so personal and raw like this. So props to all the amazing, brave authors! Listen, I have nothing to add because everything you said is fabulous. I love the pictures you took, and the quotes you used. The quote you did with the picture.. when I read that in the book, it spoke to my soul. I had to stop reading, sob, and thank Neal Shusterman for existing. And now I am crying again just thinking about it. This book. No words. We definitely need to thank Neal Shusterman for existing. We should give him cake and a very shiny sticker that says You Are Incredible Please Never Stop Writing. Wow this book sounds really emotional and memorable too – I can imagine something like this would be moving to read. It definitely is a risk writing about personal experience (especially when people can criticise elements of the story), but it also can make the whole meaning more profound. I’m definitely adding this to my TBR Cait, fantastic review! I LOVED THIS BOOK. It was awesome. I wasn’t as confused as everyone else, I guess… I don’t know why, but the entire book just spoke to me in such a way that it really worked out for me in the end. It was beautiful, as you said, and it was awesome making those connections between real life and his delusions. And, in the end, I think it gave me a better understanding of schizophrenia in general, which is good, because a member of my extended family also deals with it. I read this book a few days ago and loved it! A definite 5 star read for sure. I’ve had a close experience with mental illness and thought this book portrayed it so beautifully. This is actually the first Shusterman novel I’ve read but it’s definitely compelled me to pick up some of his other books! I agree with the beginning being a little (a lot) confusing, but once I was finished and I could see how it helped give a full picture of the story it made it completely worth it. On a side note I love the photography you’ve been including in your posts recently! As soon as you said it was about mental illness, I was totally sold. Then you talked about how half the book is about the delusions and half is real life and what no boy meets girl and everything is alright and the author being able to relate and YES I NEED THIS BOOK NOW. This sounds so intense and amazing. I’ve never read any Shusterman books. Honestly, I didn’t know what I was missing out on! Yours is the first review I’ve read for this book and apart from that, I haven’t heard anything about this one, which is unfortunate. It sounds incredible and like it tackles mental illness with such care. Anyway, definitely want to check this one out! You’ve sold me. Lovely review and loved the quotes you shared. YAY I AM SO GLAD!! After reading your review, I’ve open this book right away. I can already tell : I’m going to love it ! !